Purnima, the full moon day, in a Hindu Lunar Fortnight is considered auspicious to perform Goddess Lakshmi puja. There is a popular belief that if a family performs Lakshmi puja on full moon night together then they will always have the blessings of Maa Laxmi. Two of the important pujas dedicated to Goddess Lakshmi, the Kojagri Lakshmi puja and Gajalaxmi puja is observed on full moon night. 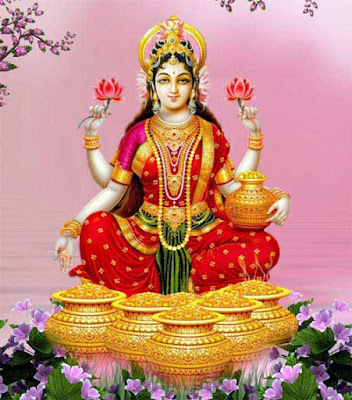 It is meritorious to perform Lakshmi Puja on the full moon day in Kartik Month. Goddess Lakshmi is offered special pujas on full moon day by chanting the Sri Suktam and Lakshmi stotra. It is believed that Goddess Lakshmi visits earth on full moon day. She visits homes that are neat and clean. She resides in homes of devotees who have unwavering devotion. She abandons fickle minded people who curse on the slightest misfortune, abandons puja, worship, and blame the ill luck on gods and goddesses. It is said that she is attracted by the lamps lit on full moon night in homes before Gods and Goddesses. It helps in overcoming all kinds of problems in life. It is good for people who are facing debts and other financial problems. It is performed to overcome property disputes. It is also performed for good business results and for getting jobs. How to perform Lakshmi Puja on Purnima? On the purnima day, clean the house and get rid of all kinds of junks. In the evening, take bath after sunset. Do the puja before an image of Goddess Lakshmi when full moon is visible. You should face north or northeast. Light a lamp using pure cow ghee. Offer yellow or white color flowers. Offer chandan or sandalwood paste. Apply it as tilak on forehead. Chant the mantra - Om Shree Mahalakshmayee Namah (ॐ श्री महालक्ष्म्यै नमः। ) 108 times.